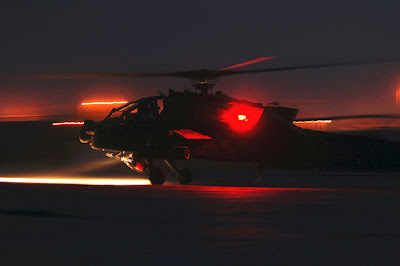 A U.S. Army Apache attack helicopter maneuvers down the Taji, Iraq, Army Airfield flight line before a night reconnaissance mission, April 18, 2010. Semisubmersible Drilling Rig ‘Deepwater Horizon’ reports explosion/fire onboard, says Transocean Ltd. The rig is in the Gulf of Mexico, in Mississippi Canyon block 252 and around 41 miles, (66 km) offshore off the Louisiana coast. ... And I totally agree with Velshi’s above link statement too! The previous statement, Missing workers may have been found in lifeboat, has not panned out as we all first hoped. The search is still on for the 11 missing. The initial reports that 12 workers were missing... turned out to be only 11. There were actually a total of 126 crew members on the rig at the time of the accident. The U.S. Coast Guard has counted a total of 98 survivors on two oil service boats and 17 injured... seven who were critically injured and had been taken to hospitals. Sadly though... Eleven are still unaccounted for as of this update. The crew’s wakeup call at 12:21am EDT was “The Star Spangled Banner,” played for Commander Alan G. Poindexter, who is wrapping up his second spaceflight. A U.S. Navy captain, Poindexter served as a pilot on STS-122 in February 2008. 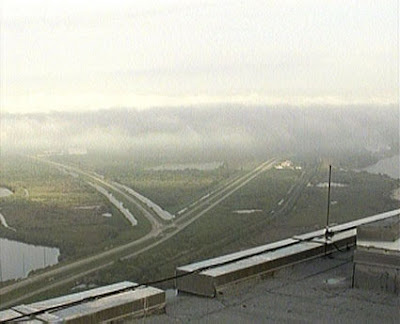 Forecasts for a landing at Kennedy Space Center are not promising, calling for high overcast and two layers of scattered clouds, as well as a chance of showers in the area. 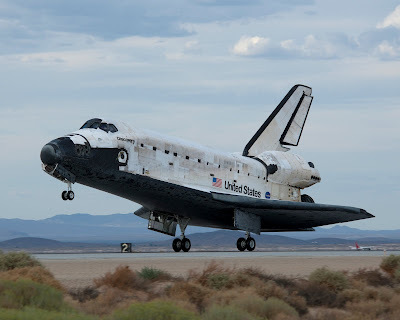 If needed, on Tuesday there are landing opportunities at Kennedy and the backup runway at Edwards Air Force Base, Calif. Weather permitting... First landing opportunity in Florida is scheduled for today at 8:48am. Image above: Weather conditions partially obscure this view of the Shuttle Landing Facility at Kennedy Space Center in Florida. Mission Control Entry Flight Director Bryan Lunney has given Discovery's seven astronauts a "no go" to perform the deorbit burn and decided to wave off the 10:23am EDT landing opportunity because of continued low cloud coverage at Kennedy Space Center's Shuttle Landing Facility. The first Kennedy landing opportunity Tuesday is on orbit 237 with a deorbit burn at 6:28am and landing at 7:34am. Edwards Air Force Base also is expected to be called up for Tuesday landing opportunities. Space Shuttle Discovery will spend another day in orbit after two landing opportunities at Kennedy Space Center in Florida were foiled by clouds and rain in the area. Forecasts call for Florida conditions to improve Tuesday and for generally good weather in California. Commander Alan G. Poindexter, Pilot James P. Dutton Jr. and Mission Specialists Dorothy Metcalf-Lindenburger, Rick Mastracchio, Stephanie Wilson, Clayton Anderson and Japanese astronaut Naoko Yamazaki will have two more opportunities to land at Kennedy on Tuesday, as well as three at Edwards Air Force base in California. The first Kennedy opportunity Tuesday would see a deorbit burn at 6:28am EDT with a landing at 7:34am. For the second opportunity the deorbit burn at 8:02 a.m would lead to a landing 9:08am. For Edwards, the first opportunity deorbit burn would be at 7:56am with landing at 9:01am. The next would have a deorbit burn at 9:30am and a landing at 10:35am while the third would begin with a deorbit burn at 11:05am leading to a landing at 12:1pm. Discovery has enough consumables to remain in orbit until Wednesday. There are a total of six landing opportunities at the three U.S. landing sites that day. Entry Flight Director Bryan Lunney and his team have given Discovery's seven astronauts a "go" for deorbit burn at 8:02 a.m. EDT to slow the shuttle on its descent to a 9:08 a.m. landing on runway 33 at Kennedy Space Center. The weather has improved and is both "go" observed and "go" forecast at landing time. The landing will take the shuttle over Vancouver, northeast Washington, near Helena, Montana, over central Wyoming, across Kansas to northeast of Tulsa, Oklahoma, north of Little Rock, Arkansas, over Oxford, Mississippi, near Montgomery, Alabama, north of Albany, east of Valdosta and south of Columbus, Georgia, and, finally, over Florida east of Gainesville and west of Jacksonville.
. About Image: Space Shuttle Discovery lands at Kennedy Space Center in Florida, completing the STS-131 mission to the International Space Station. 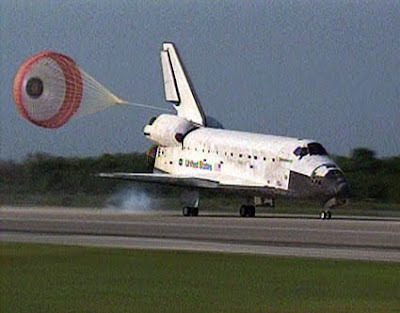 With Commander Alan G. Poindexter and Pilot James P. Dutton Jr. at the controls, space shuttle Discovery descended to a smooth landing at Kennedy Space Center in Florida. The STS-131 crew members concluded their successful mission to the International Space Station when the shuttle touched down at 9:08 a.m. EDT. Discovery arrived at the station April 7, delivering more than seven tons of equipment and supplies. 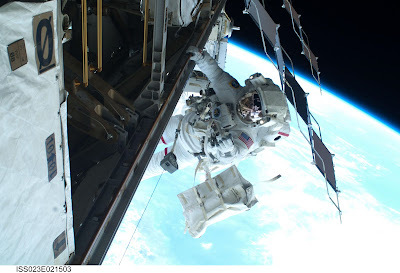 During the 10-day stay, Mission Specialists Rick Mastracchio and Clayton Anderson conducted three spacewalks to install a 1,700-pound ammonia tank assembly on the station’s exterior to replace a depleted predecessor. They also replaced a rate gyro assembly, retrieved a Japanese experiment and two debris shields. Soldiers return fire during an attack in Kunar province, Afghanistan. U.S. Army Spc. 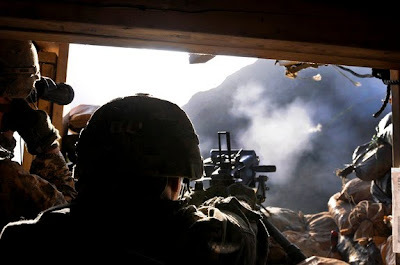 Greg R. Kenshalo fires an automatic grenade launcher during an attack on Combat Outpost Bar Alai in Kunar province, Afghanistan, April 5, 2010. Multiple insurgents with automatic machine guns opened fire about seven hours after a sniper also shot at the base. No members of Afghan or international forces were injured during the attacks. Kenshalo is a rifleman with Troop C, 3rd Squadron, 61st Cavalry Regiment. Iraqi Security Forces, supported by United States Forces, killed the two most-senior leaders of al-Qaeda in Iraq (AQI) early Sunday morning during a series of joint security operations 10 km southwest of Tikrit. 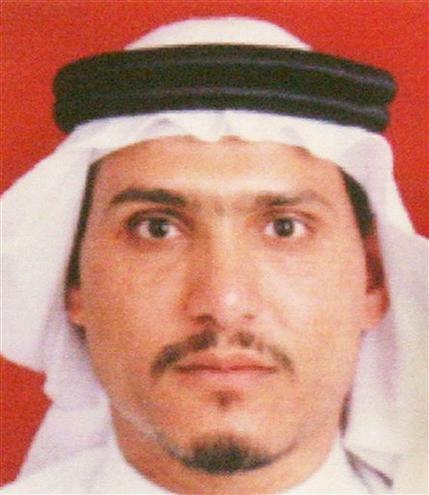 Abu Hamzah al-Muhajir, also known as Abu Ayyub al Masri, is the military leader of AQI, the terrorist organization responsible for facilitating attacks against Iraqi and Coalition forces as well as Iraqi civilians. Abu Ayyub al Masri replaced Abu Musab al Zarqawi when Zarqawi was killed in June of 2006 and is directly responsible for high profile bombings and attacks against the people of Iraq. The death of these two terrorists is a potentially devastating blow to AQI. A series of Iraqi-led joint operations conducted over the last week resulted in the Iraqi Forces, with U.S. support, executing a nighttime raid on the AQI leaders’ safehouse. The joint security team identified both AQI members, and the terrorists were killed after engaging the security team. Additionally, Masri’s assistant, along with the son of al-Baghdadi, who were also involved in terrorist activities, were killed. After conducting preliminary questioning and initial examination of the evidence during the operation, Government of Iraq elements arrested 16 additional suspected criminal associates of the warranted individuals. During the operation, a USF-I Soldier was killed during the assault when a U.S. helicopter crashed. The STS-131 and Expedition 23 crew members gather for a group portrait in the Kibo laboratory of the International Space Station while Space Shuttle Discovery was docked with the station on Flight Day 10. 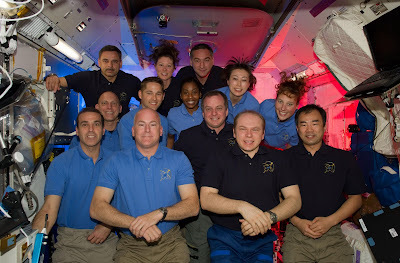 STS-131 crew members pictured (light blue shirts) are NASA astronauts Alan Poindexter, commander; James P. Dutton Jr., pilot; Clayton Anderson, Rick Mastracchio, Dorothy Metcalf-Lindenburger, Stephanie Wilson and Japan Aerospace Exploration Agency astronaut Naoko Yamazaki, all mission specialists. Expedition 23 crew members pictured are Russian cosmonauts Oleg Kotov, commander; Mikhail Kornienko and Alexander Skvortsov; Japan Aerospace Exploration Agency astronaut Soichi Noguchi, and NASA astronauts T.J. Creamer and Tracy Caldwell Dyson, all flight engineers. 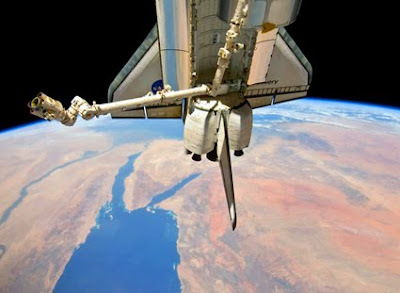 About Image: The aft section of the docked Space Shuttle Discovery and the Station's robotic Canadarm2 are featured in this image photographed by an STS-131 crew member on the International Space Station. The Red Sea, Sinai Peninsula (center) and Nile River (left) are seen approximately 215 miles below. The third and final STS-131 Spacewalk is scheduled to begin at 3:11 a.m. EDT Tuesday and should last 6.5 hours. 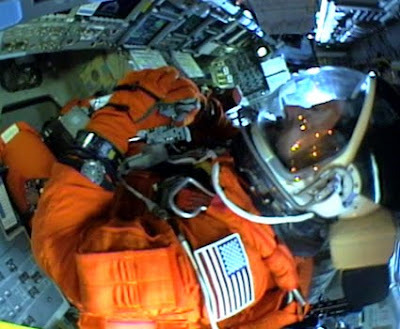 Activities include finishing the complicated change out of the large ammonia tank assembly, retrieving micrometeoroid shields from outside the airlock and retrieving a light-weight adapter plate assembly. Astronaut Rick Mastracchio works on the truss section of the International Space Station during the second spacewalk of the STS-131 mission. Monday’s Early Morning Launch looks like a GO! The Closeout Crew working at Launch Pad 39A confirmed Space Shuttle Discovery's side hatch is closed for flight. Once the hatch is completely sealed and the crew cabin checked for leaks, the team will complete their work inside the environmentally controlled room that provides access to the shuttle's crew compartment. The good weather at NASA's Kennedy Space Center in Florida continues to cooperate, and the launch team is not reporting any problem that would prevent an on-time liftoff at 6:21am EDT. Commander Alan Poindexter is set to lead the STS-131 mission to the International Space Station aboard Space Shuttle Discovery. Joining Poindexter will be Pilot Jim Dutton and Mission Specialists Rick Mastracchio, Clay Anderson, Dorothy Metcalf-Lindenburger, Stephanie Wilson and Naoko Yamazaki of the Japan Aerospace Exploration Agency. Discovery will carry a multi-purpose logistics module filled with science racks for the laboratories aboard the station. The mission has three planned spacewalks, with work to include replacing an ammonia tank assembly, retrieving a Japanese experiment from the station’s exterior, and switching out a rate gyro assembly on the S0 segment of the station’s truss structure. STS-131 will be the 33rd Shuttle Mission to the station. The clock is once again ticking down, and liftoff of Space Shuttle Discovery on its STS-131 mission to the International Space Station is a little more than an hour away. Coming up at 5:27am EDT, the countdown will pause again at T-9 minutes for the final planned hold. Space Shuttle Discovery and a crew of seven astronauts are headed to space, beginning a 13-day mission to the International Space Station. Discovery's two solid rocket boosters ignited right on schedule at 6:21am. EDT, sending the shuttle soaring past the launch tower at NASA's Kennedy Space Center in Florida. The boosters will burn out about two minutes into the climb, as Discovery's three main engines finish the job of delivering it to orbit and the external fuel tank falls away. Main engine cutoff will come at about eight and a half minutes into the flight. Above info and images from the NASA.gov website . Along with a VERY Successful Mission, STS-131!